Summary: It can sometimes be difficult for children with type 1 diabetes, celiac disease, or food allergies to participate in celebrations at school. 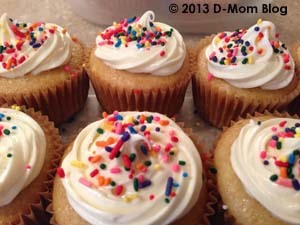 Freeze carb-counted, gluten-free, or allergen-free cupcakes to have them on hand at school. With the exception of her kindergarten year when the nurse was only at school for about 20 minutes at lunchtime, we have been able to work with the teachers, school staff, and a part-time nurse to make sure that Q can participate in classroom birthday celebrations. 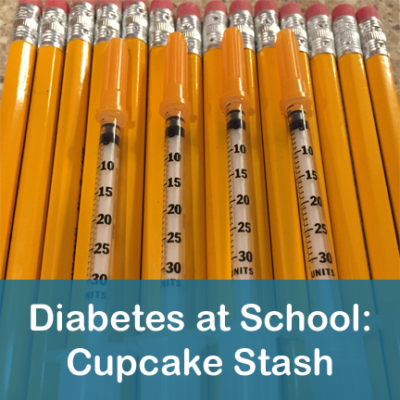 One teacher liked to have celebrations right after lunch, so the nurse would add in the carbs for the treat into her lunchtime bolus. One teacher had celebrations at the end of the day, so I would give her insulin when she greeted me after school. But we usually kept some “treats” on hand in case the birthday snack was completely inappropriate. It’s always been important to us not to have her alienated at parties because of her diabetes. But the tree nut and milk allergy has really thrown us for a loop this past year! Last school year I kept a stash of Oreos on hand for her to grab instead of home baked or bakery cupcakes that often came in and which usually had questionable provenience in terms of cross contamination with nuts. This year I’ve taken to baking our own dairy- and nut-free cupcakes, freezing them, and keeping them stocked both at home and at school. Wendy of Candy Hearts actually gave me the idea to freeze cupcakes, which she does because her daughter is gluten free. She bakes and frosts them, freezes them flat and then tosses them in a plastic bag. So now when there is a celebration at school, the nurse takes a cupcake from her freezer about 20-30 minutes ahead of time and it is thawed in time. 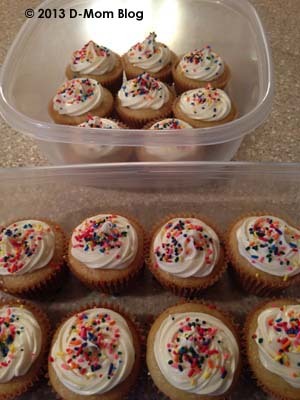 Whether you need some treats at school with a known carb count, have a child with celiac disease and need to stock gluten-free cupcakes, or are dealing with food allergies, freezing cupcakes and keeping them at school is a great option so that your child with special dietary needs doesn’t feel deprived. 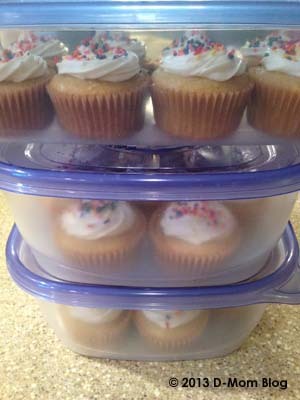 Tip: I place the unfrosted cupcakes into the storage containers and use my pastry bag to pipe icing on in place to make it a little less messy and save steps. What a great idea! My daughter has a dairy allergy…and dairy is in EVERYTHING! Doing this, I’ll know she’s eating dairy-free AND what the carb-count is. Thanks for sharing! I know, right?! A parent brought in angel food cake last week for her child’s birthday and my daughter could actually eat it. I love this idea!! I was just at my son’s school Monday (for his 504) and we were brainstorming with his soon-to-be kindergarten teacher about birthday treats & how to handle it … keeping frozen ones on hand is brilliant! Do you have a certain recipe that you use that’s lower carb? We don’t necessarily use a lower carb recipe (cupcakes are totally bolus worthy! ), but I often use recipes in Vegan Cupcakes Take Over the World. I also buy the nut-free mini cupcakes at the store and freeze them.